Landfill Management Software by RC Technologies. With extensive reports and enhanced security system, our Landfill Management System is the right choice for your company. .
With extensive reports and enhanced security system, our Landfill Management System is the right choice for your company. Window based software compatible with Windows XP, 2000, ME, 98, and 95. Landfill Management Software is designed to interface with scales to provide load charges, store Tare weight, create invoices and statements and print various summary and accounting reports. Recording of payments to be posted to customer balances. Easy lookup for customer inquiries related to account activity. 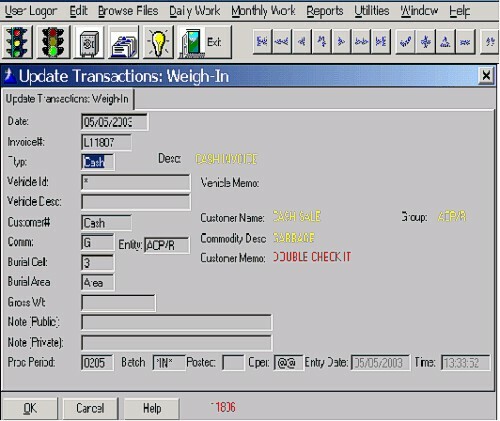 Vehicle file lookup to validate charges and assign customer identity. Interfaces to scale indicator to automatically record in-weight and out-weight to calculate total charge. Private and public notes can be associated with each invoice for recording additional information. Multi-year retention of all transactions. Various tipping fee structures based on commodity. User defined tipping fee structures, with optional minimums. Ability to assign non-taxable status for customers or entities. Ability to export customer records and transactions to Microsoft Excel. It offers extensive security features. Transfer stations modules are available. Developed by a C.P.A with over 25 years of Fund Accounting experience. Provides a total integrated solution for all your waste management sites. Demo cds available upon request. Recommended configuration: P III 700 MHz or above, 256 MB memory, CD RW, Windows XP Pro (not recommended for use with XP Home), a dedicated impact printer for receipt printing - we recommend the Okidata 320 or 420. Weigh-in and weigh-out is a snap when using our system. 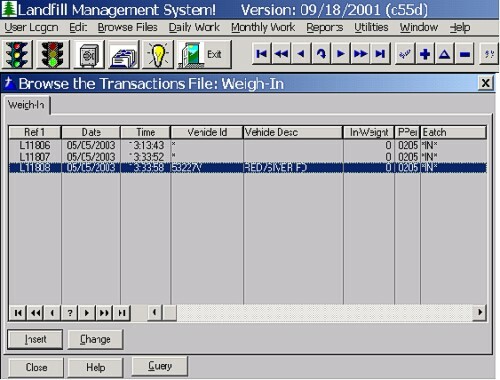 The default transaction is a Cash sales, but you can easily change this to a change. You can also enter a vehicle ID to pull up stored Tare Weight. All the active vehicles are stored for easy selection on Weigh-out. Highlight the vehicle you want to weigh-out and click change.